C. S. Lewis’s How To Pray, Ch. 6: Morbid Confession? Each chapter in this new book by HarperOne, How To Pray (HTP), is entitled with a question, for which the excerpt from Lewis’s writing provides the answer. In this chapter, the question is, “Does Prayer Require Morbid Introspection of our Sins?” The answer comes from the last few paragraphs of Lewis’s essay, “Miserable Offenders,” which appears in God In The Dock. Actually, the answer is the last paragraph of the essay, where Lewis asks the question, “Does Christianity encourage morbid introspection?” He answers by saying that thinking of one’s own sins “is the reverse of morbid.” He illustrates this by contrasting the difference between walking around with the pain of a bad tooth, and the relief of knowing that the pain of that tooth’s extraction will soon be gone. It’s more morbid to live with unconfessed sin. Confession of sin leads to the joy of forgiveness, which is an opposite of morbidity. This excerpt is a bit awkward. The first sentence jars us with an unknown antecedent of the argument. “When God looks into your office, or parish, or school, or hospital, or factory, or home, He sees all these people like that” (p.59). Like what? And why does Lewis specifically refer to the terms “contrite,” “miserable,” and “intolerable” on p. 62 (of HTP)? We are obviously in media res here. The word “that” refers to seven previous paragraphs of discussion in “Miserable Offenders” about prayers of confession in the Book of Common Prayer. The three terms mentioned on p. 62 come from those prayers. Most of the essay is actually an attempt to help us understand those terms for the good of our prayers of confession. This last paragraph about morbidity is a framing conclusion to the whole essay. When you read this excerpt in HTP, you have to not be distracted by what has obviously been left out. Just profit as you can from what is present. But the essay as a whole is an important context for these latter paragraphs, as one would expect. Lewis is trying to get us to face the effect of chronological snobbery upon our prayers. We think the way we feel about confession defines what is true about confession. What people in the past have thought of confession was wrong, because, in our opinion, they were too morbid. Our understanding about prayer today is affected by the priority of feelings in prayer, laid on us by the modern world. Lewis wants to disabuse us of this concern for feeling because it spoils our confession. In order for our confession to really “work” and be profitable, we have to learn to face the reality of our condition. Our feelings can get in the way of that, because we can fail to recognize our true condition. It is possible for us to feel like we are doing fine, when there is actually something in our lives that is ruining us, which others may see, but we cannot. Lewis illustrates this by imagining a train about to wreck, with the passengers inside feeling just fine, because they do not know their danger. Lewis knows there are terms used in prayers of confession in The Prayer Book that moderns don’t like because they don’t feel like it’s true of them or they are too morbid for their sentiments. He uses an explanation of just what these terms mean – vs. how they make us feel – as a way of bringing us to a true and effective prayer of confession. It’s quite brilliant. As we would expect from Lewis’s other writings about prayer, a prayer that really deals with God on God’s terms is a prayer that begins with total honesty about one’s self. As has been mentioned, part of that honesty is recognizing that we are in worse shape than we think. But, that does not lead to despair, nor is it solved with morbid introspection. Rather, we cast what we honestly do know about ourselves upon the grace and mercy of our loving God, who, knowing everything about us before we were even born, made full provision for the forgiveness of our sins in the blood of His own Son, Jesus Christ. Reference: C. S. Lewis, How To Pray: Reflections and Essays, (New York, HarperOne, 2018), ISBN-13: 978-0062847133. Please note that the content and viewpoints of Rev. Beckmann are his own and are not necessarily those of the C.S. Lewis Foundation. We have not edited his writing in any substantial way and have permission from him to post his content. The Rev. David Beckmann has for many years been involved in both the Church and education. 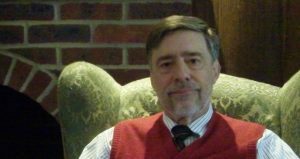 He helped to start a Christian school in South Carolina, tutored homeschoolers, and has been adjunct faculty for both Covenant College and the University of Tennessee, Chattanooga. He founded the C.S. Lewis Society of Chattanooga in 2005. He has spoken extensively on C.S Lewis, and was the Director of the C.S Lewis Study Centre at The Kilns from 2014-2015. He is currently a Regional Representative for the C.S. Lewis Foundation in Chattanooga. Bookmark this article C. S. Lewis’s How To Pray, Ch. 6: Morbid Confession? Inspired by the life & legacy of C.S. Lewis, we encourage & equip Christians to live out their faith within the world of ideas & the arts.